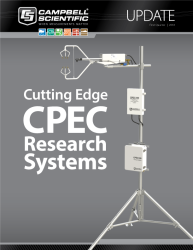 Each system typically includes an EC155 closed-path gas analyzer, CSAT3A sonic anemometer (ordered as an option), CR6 datalogger (ordered as an option), sample pump, and enclosures that house the electronics. The CPEC310 also has a valve module that provides automatic zero and span, and an optional scrub module that provides a convenient source of zero gas. Often the CDM-A116 16-channel analog input module is ordered with a CPEC306 or CPEC310 to connect additional energy-balance and meteorological sensors. The CDM-A116 fits inside the system enclosure. We look forward to the improvements these systems will bring to eddy-covariance measurements.